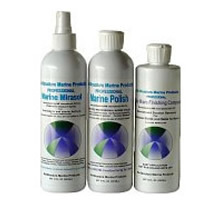 Restructure Marine Products LLC evolved from our own needs and needs expressed by boat owners who berth their boats in a harsh salt-water environment and car owners who wanted an easy to use long lasting polish. 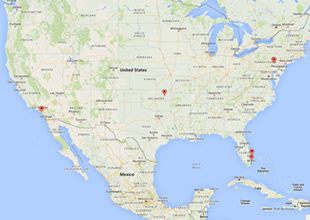 Our customers wanted to protect their boats and cars and ultimately their investment beyond traditional methods. We explored the scientific world of Nanotechnology and found RALG® and Tempre-Flex that are the critical ingredients of our product lines. We developed a family of products based on RALG® and Tempra-Flex that became the products that we provide today. Restructure Professional Marine Polish with one application followed by periodic soap free wash downs you will be able to extend your polishing schedule for longer periods of time and still maintain that deep, lusterous shine. No more swirls. No more “3 day wax jobs.” A team of 2 can apply this new molecular based bonding polish to a 53′ yacht in less that a full day. RMP Crystal Diamond Glaze products are a derivative of our highly successful group of Marine Polish products also Nanotechnology produced using RALG®. 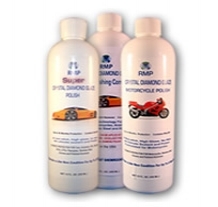 RMP Crystal Diamond Glaze products have been specially nano reformulated to work with the Acrylic Enamel, Urethane, Lacquer and Clear Coat paints used by the majority of Yacht, Auto, Airplane, Helicopter, Motorcycle and RV manufacturers. 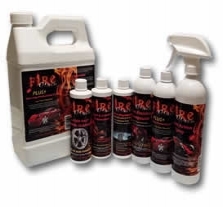 Fire Glaze products work just as well in the Marine environment but were specifically designed to work with the enamels and clear coat finishes of automotive type vehicles. All of our products provide long term finish protection for your Yacht, Auto, Motorcycle, Airplane, Helicopter and RV with new Nanotechnology based Marine, Auto and Aviation polishing products from Restructure Marine Products LLC.